Democratic debate: Slate's review of what happened in Las Vegas. 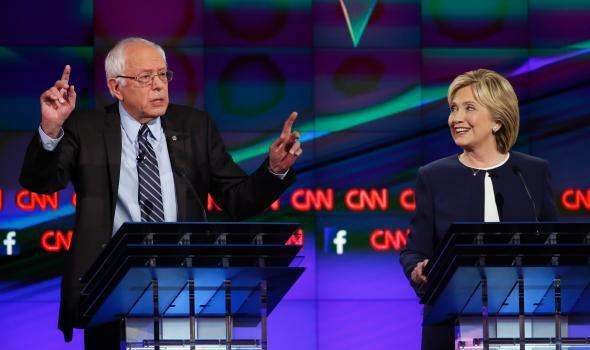 Bernie Sanders and Hillary Clinton during the Democratic debate in Las Vegas on Tuesday. Clinton’s claims about her record on climate change (specifically in regard to the 2009 Copenhagen summit) were either disingenuous or delusional. As was Bernie Sanders’ justification for his NRA-friendly voting record on guns. She was also forceful on the issue of Planned Parenthood. Martin O’Malley had trouble defending his record as the mayor of Baltimore. Moderator Anderson Cooper was sharp, well-prepared, and willing to push back against slippery answers. An early exchange about capitalism made clear that Bernie Sanders, while quite liberal, isn’t actually all that much of a socialist. On the lighter side of things, Clinton made what was probably the first-ever presidential debate reference to how long it takes women to use the bathroom. And Jim Webb alluded casually to the time that he killed a North Vietnamese soldier who had thrown a grenade at him. Finally, if you don’t have time to read any of that, here’s our video recapping the entire debate in 90 seconds!